What's the Return on Education? Higher education yields measurable benefits to students. The completion of a college degree enhances your earning potential, builds a community of friends, and hopefully enriches and refines your intellectual appetite. Economists often cite education as an example of a positive externality--educated people improve government and generate new ideas. 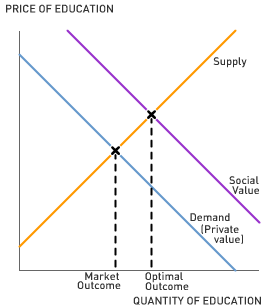 When the social benefits of an activity exceed the private benefits, government subsidy may lead to a more socially optimal outcome than the private market outcome. However, as the commentary points out, economists struggle to accurately measure the social benefits from education, making it difficult to assess the appropriate level of government subsidy. 1. According to Alan Krueger, by how much does an additional year of education increase an individual's earnings? What factors play a role in determining the magnitude of the benefit a student receives from an additional year of education? 2. According to research by Lawrence Katz and Claudia Goldin, improvements in educational attainment in the United States from 1915 to 1999 accounted for what percentage of GDP growth during the same period? 3. According to the article, the move toward universal high school education between 1910 and 1940 was the most important factor contributing to the education of the American workforce during the 20th century. Do you think universal college education would produce similar gains? Do you think certain academic majors generate larger social benefits than others? What, if any, major fields of study should the government encourage in order to foster innovation and technological breakthroughs?